Jan. 25, 2019, ©. Leeham News: We have covered the pitch stability for an airliner including some well know problems around deep stall. We now continue with other frequent problems as the aircraft covers a large envelope in speed and altitude. Figure 1. The pitch moment coefficient curve of an early DC-9 candidate. As a subsonic airliner flies at or faster than its cruise Mach (0.785 for a 737ng/MAX) the transonic effects on the wing affects pitch stability, Figure 2. The increased rearward movement of the supersonic area on the wing’s top with increased speed will move the area of low air pressure further back on the wing. Figure 2. 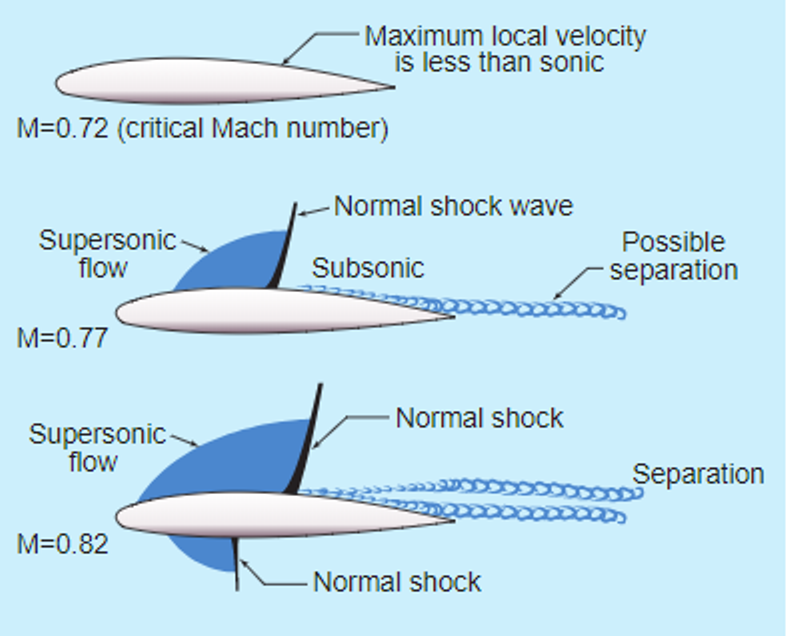 Supersonic flow around an airfoil at normal airliner cruise speeds. Source: Wikipedia. This will move the center of pressure of the wing further back, causing a nose down pitch moment. The changed flow over the main wing can also affect the flow field for the horizontal stabilizer. The horizontal stabilizer is in a downwash flow field caused by the main wing. This increases the Angle of Attack (AoA) for the stabilator as its flying as an upside-down wing to generate a stabilizing pitch up moment. The downwash over the tail often decreases with increased Mach. The local negative lift AoA then decreases on the tail, causing the pitch up moment from the horizontal stabilizer to decrease. This can worsen the pitch down further from an increased Mach. The phenomena is called Mach tuck and it’s dangerous as a pitch down of the nose increases the Mach further if not controlled. Early high-speed aircraft had big problems with Mach tuck and it was a major reason for the introduction of the pitch trim by an all moving stabilator. Aircraft with fixed stabilator and elevator-only pitch up authority had problems countering Mach tuck (the elevator run out of pitch-up authority). The stabilator was therefore made movable in the forward end and the whole horizontal stabilator could be trimmed nose up to counter Mach tuck, leaving the elevator free to accepts the pilot’s inputs for fine control in pitch. Airline OEMs introduced automatic Mach trim to counter the Mach tuck when the speed increased with jet airliners. The Mach tuck countering trim on the 737 is called Mach trim and it starts trimming nose up from Mach 0.615. The trimming is automatic in the background both when flying manually and with engaged Autopilot. The sensitivity of the aircraft to pitch control through movements of the elevator changes with speed and altitude. At low speed the sensitivity is low and at high-speed it’s high. The sensitivity also changes with altitude, where high-speed at low altitude makes the aircraft very sensitive to elevator movements. 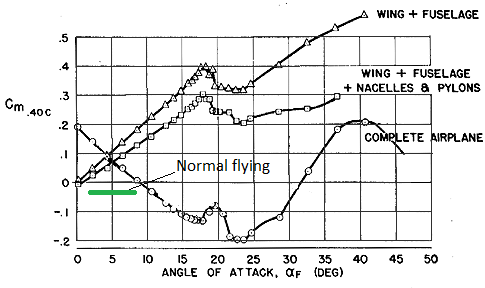 Low altitude flight at high speed (=high dynamic pressure) is the area for Pilot-Induced-Oscillation, PIO, a dangerous coupling of the aircraft’s pitch movements through the Pilot via the control column to the elevator. At the high dynamic pressure situation, the pitch control channel is too sensitive and the aircraft can pitch oscillate in a divergent mode until it breaks. An airliner designer has to protect the aircraft from over control by the pilot at high speed while giving him adequate pitch authority at low speed. This requires a variable gearing of the elevator movement versus stick/yoke force. At low speed, the elevator shall have a large movement from a control column input, at high speed a small movement. This is difficult to achieve with mechanical controls as variable gearing gearboxes can be unreliable. In-service solutions use cam curves or varying diameter cable pulleys to obtain some variable gearing. The 737 uses a varyiable pitch force system called the Elevator feel system to stop Pilots overcontrolling at high speed. The force of a roller against a cam is regulated by aircraft speed and altitude, making the controls forces heavier at high speed. The need for a variable flight control gain with speed and altitude was the primary reason civil airliners changed to Fly-By-Wire flight controls. As civil airliners are not allowed to be unstable in any axis the reason for using the first airliner Fly-By-Wire flight control system on the Concorde was the need to vary the flight control gain as the speed went from 160kts airfield speeds to Mach 2.0 cruise speed and altitude went from 0ft to 55,000ft. There are further control problems we need to handle at low speed. The 737ng has a low-speed control system called Speed trim which we will talk about in the next Corner. Wouldn’t the Mach Trim or Speed Trim be subject to the same problem as the MCAS, that they could go haywire due to faulty information? Have the Mach Trim or Speed Trim ever gone haywire like the MCAS, and the pilots have disabled them, or have they been 100% reliable to date? Has a mechanical system failed ? It was probably a fault indication from the system around the Mach trim function. It involves several units, the Air data sensors and computer, the Flight Control Computer which has two processors checking each other and the actuator. In case of the 737 the Mach trim is trimming through moving the elevator. to my knowledge, these have a more redundant sensor processing before they are allowed to trim the aircraft. The functions are active in the background during every flight of the aircraft, Mach trim at high speed and Speed trim at low speed. MCAS is there to function in a highly remote corner of the flight envelope, tight fighter like high G turns or flying close to stall with clean aircraft, a flight case that no transport pilot should put himself in. Hence it was judged it could be implemented with less redundancy. We know now this was no good idea but this is hindsight. Hindsight is a wonderful thing, but to me it seems that there was a significant lack of foresight regarding the implementation of MCAS on the MAX. The only question is, why? It smacks of one of those things where there were myriad opportunities for “doing it properly”, either by documenting it, designing it with more redundancy, training for it, etc, but none of these were taken up. Probably any single one of these, if followed, either in Boeing or the FAA, would have made a big difference. Here in the UK, this is the kind of thing that a Coroner’s Court would be expecting a Chief Engineer to explain (MoD got into severe trouble a few years back for not having a Chief Engineer, a fact that came out following the fatal loss of a Nimrod in the Middle East). It’s a Chief Engineer’s job to sit above it all and police the whole engineering process, in effect to make sure that foresight is part of it. And for that to be effective, the Chief Engineer needs the authority to halt work, etc. The US DoD Chief Engineer department can do this, for example, irrespective of the financial pain that might cause. So I’m wondering whether Boeing and the FAA has something like a Chief Engineer department, and whether it has the authority to do its job properly. If not, that’s probably a corporate failure, the responsibility for which the company board and chairman are responsible, or the head of the FAA. Here in the UK, that responsibility is effectively one of personal criminal liability these days, as companies generally find out when the Health and Safety Executive comes knocking on the door. Tends to focus minds a bit. What I suspect has happened is that concerns about MCAS were raised by various engineers along the way, but the company structure and processes acted to suppress all of these. Suggestions like “add redundancy?” may have been countered with “no, we’ll cover it in the documentation”, but then others resisted making changes to the pilot’s manuals. I’m not connected to Boeing or they FAA in any way whatsoever, so I don’t actually know for sure that this is what’s happened, but I wouldn’t be surprised if that is what emerges, eventually. It seems very unlikely that every single one of those engineers failed to raise questions about how MCAS was designed or documented. A healthy process would have raised those questions up to a suitable level, namely the Chief Engineer. An unhealthy process would see that suppressed. There was an interesting situation in 2012 of a Norwegian Air Shuttle 737 flying from Helsinki to a Finnish airport which when coming into landing went pitch up and came very close to the stall, but the pilots were able to recover . The basic cause seemed to be anti acing fluid was penetrating the tail cone- fuselage and affected the PCUs which operated the elevator. If MCAS was only operating in a highly remote corner of the flight envelope, why didn’t they make the envelope slightly smaller?Was it an effort to maintain type rating?